When it comes to warm-weather bridal gowns, sometimes it seems like it’s all been done. From sweetheart necklines to barely-there spaghetti straps to even high-hem lengths, the approaches to summer wedding dressing can easily become a bit overdone and not-so-modern—which is why we enlisted the help of renowned Style Me Pretty founder and editor Abby Larson to give us her picks for the prettiest summer wedding dresses ever. From light, sheer fabrics to experimenting with color, Larson has shared her top five tips for how to instantly upgrade the pretty-factor of your wedding dress this summer. Read on to learn from her wedding wisdom! 1. Play around with embellishments. A little touch of sparkle adds instant glam to any gown. 2. Go with tulle and other airy fabrics. Airy fabrics like tulle are having a major moment. Not only are they stunning, but they’re an ideal way to beat the heat for summer weddings. The sweetheart neckline, done very right. We love the romantic cutout shoulders on this gown. If there’s one day you’re allowed to wear something unabashedly dramatic, it’s your wedding day, right? There’s something very endearingly medieval about this gown. 3. Two words: lace sleeves. Three years after the royal wedding and Kate Middleton's iconic dress is still making style waves. Lace sleeves are here to stay! 4. Don’t only be open to wearing white. Barely-there pastels are a pretty and oh-so-subtle way to play with color. The off-the-shoulder asymmetry of this dress lends to its ultimate femininity. The boatneck makes this otherwise plain dress instantly elegant. 5. Try an illusion neckline. 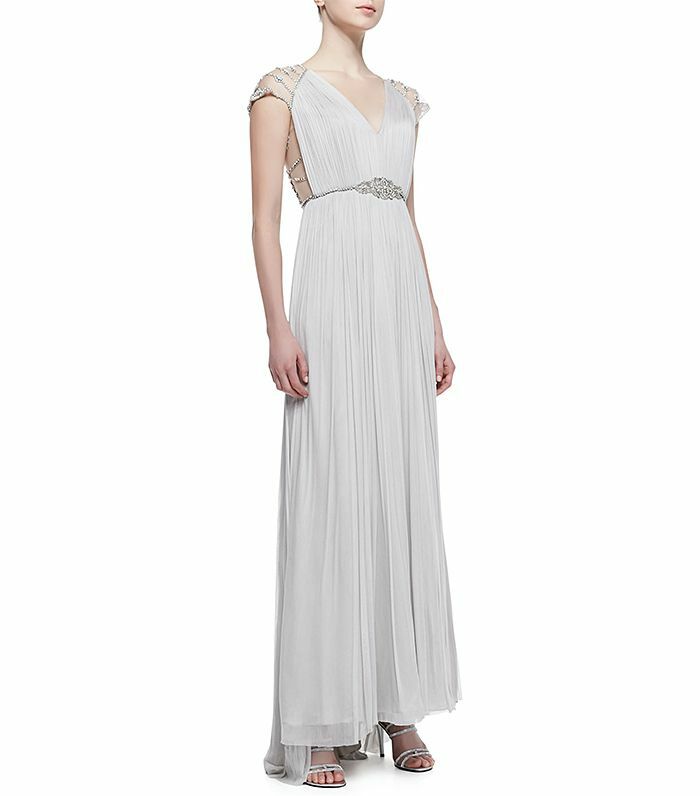 An updated look on the strapless dress, an illusion neckline creates a look that's on trend, yet classic. A great alternative to a more traditional illusion: one crafted from white lace.